Season seventeen in general is a bit of a mixed one, its stories featuring incredible performances from the leads and plenty of imagination while at the same time requiring a greater suspension of disbelief on the part of the audience to look past budgetary and production constraints and sometimes-naff supporting performances. ‘The Horns of Nimon’ squarely fits into this mould as well, encapsulating the strengths and weaknesses of the time while becoming the de facto season finale with the intended ‘Shada’ left unfinished due to the BBC strike. Actually, the concepts behind the Nimon are quite clever, a race that feeds off of planets and demands human sacrifices providing quite dark and grand visuals as a basis. At the same time, the maze of the Nimon realm as well as the design of the creatures themselves pay tribute to the legend of the Minotaur and are wonderful plot devices, and there are brief moments throughout where the production values elevate beyond obvious studio work to bring these fantastic ideas to life quite well. Of course, the powerhouse pairing of Tom Baker’s Fourth Doctor and Lalla Ward’s Romana is again the main selling point of this story. Baker is quite obviously at the height of his power and popularity within the titular role, improvising and adding a more outrageously bohemian and unpredictable side to his character. He demands all attention whenever he is on screen and is able to make the most preposterous statements and actions utterly believable, and his ability to switch to deadly serious as he condemns the villains is sublime. 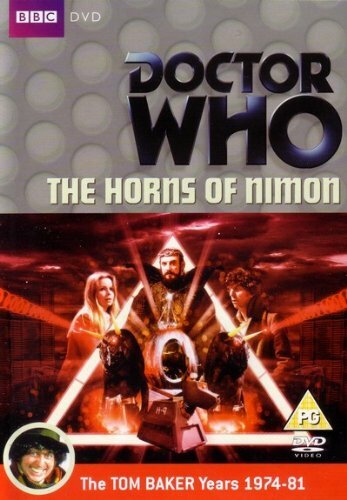 At the same time, ‘The Horns of Nimon’ is unquestionably one of the strongest stories for the second incarnation of Romana, her fantastic repartee with the Doctor already firmly established but her true equality to the Doctor shining through brightly. Lalla Ward easily takes centre stage as Romana explores and takes matters into her own hands, highlighting what a strong and engrossing presence she is. Unfortunately, the supporting cast has little going for it, the performances ranging from terribly over-the-top to completely lifeless and flat. The co-pilot is one of the prime offenders of the former category, not even deserving of a name as his all-too-apparent inferiority complex drives all of his actions, leading to the deaths of tributes, his boss, and even himself in the painful process. However, the exaggerated co-pilot is nothing as compared to Soldeed, another interesting villainous figure on paper who is driven by his own greed. Graham Crowden takes the character to the extremes of pantomime, though, any nuance of the character drowned out by his absurdly ridiculous performance that abandons all semblance of reality as the story reaches its climax. Sadly, none of the other supporting characters stand out at all no matter how much prominence they are given, though in this case that’s a good thing. Because of the extremes in performances, the overall dramatic tension of ‘The Horns of Nimon’ is substantially minimized. There are some clever ideas buried beneath the more overt parodies of the story, the backstory regarding the war and the blending of science and metaphor particular standouts, but anyone looking for the drama to dominate will be sorely disappointed. While there’s no denying an overt sense of fun about the production, ‘The Horns of Nimon’ simply can’t hold up to the better serials of the era and makes for a rather lacklustre end to an intriguing but flawed season.